Obviously, this is quite a difficult question and one that can potentially have hundreds of answers. This is because the goals, knowledge and familiarity with specific niches is entirely different for everyone. Choosing an incorrect niche can have a catastrophic impact and could lead, in most cases, to failure. 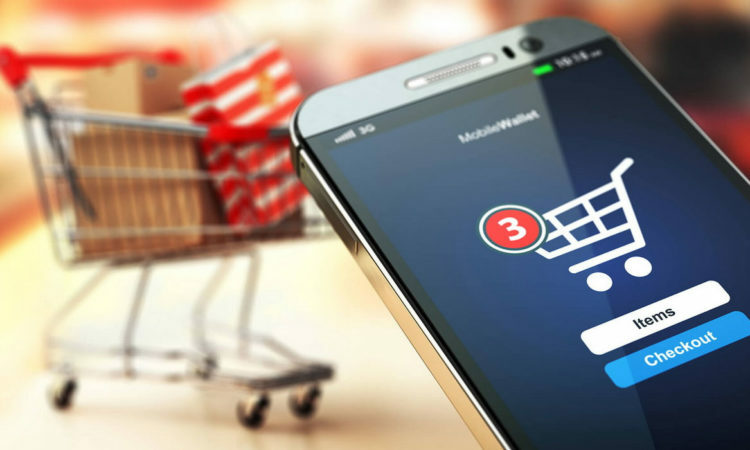 Sure, there are many consumers out there looking to buy the latest computers, mobile phones and cars, but it doesn’t mean you should align yourself in these niches just because they are potentially very popular – in fact, that’s a good reason not to, given the high competition levels. In this blog, I’m going to give you the knowledge you need to choose an active niche to heighten your chances of ecommerce success. So, What Is an Ecommerce Niche? An ecommerce niche is a category with which your products are labelled. For example, camping equipment is quite a broad term. Camping cooking equipment is a much narrower niche. Once you’ve chosen a niche, everything about your brand will be forever revolving around it. By being a niche, you’ll build an audience who are focused on the quality of the product and what it does to resolve a particular problem. Don’t ever be frightened to break down your niche again in order to give yourself a more focused audience base. Yes, you may lose a prospect or two, but you’ll be whipping up more demand for those who are captivated and super focused on buying what you have to sell. This is what is known as micro-niche marketing, and it’s something that is increasing in popularity with online marketers. A micro-niche site can rank higher for more keywords, and you’ll have much less competition to mount a challenge against. If this is all starting to sound quite easy, just remember that you’ll need to choose a niche that will certify years of commercial benefit and this is not something that can be done either quickly or simply. Why Is an Ecommerce Niche Important? There are a few online companies that can sell literally anything you can think of. This is the exception, not the rule. Amazon and eBay are prominent examples and have categories and sections for just about everything. This kind of company should not be your model for success, and although they may provide inspiration, it’s much more realistic to start out with either one or two products that people are falling over themselves to get at. 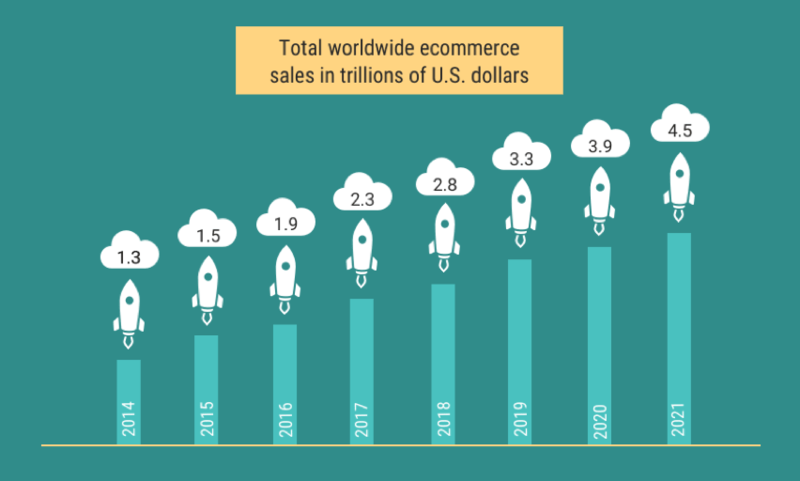 By 2021, Shopify predicts that total ecommerce spend will reach a monumental $4.5 billion. Of course, it’s true that a good deal of these dollars will be funnelled into companies like Amazon and eBay, but there’s also a good deal spent in boutique niche-focused online stores. In addition to this if you’re looking to market yourself globally, then there’s literally a whole world of opportunity. To make the most of the above graphic, you need to drill down to the specifics. If you start with something you’re passionate about, then it’s a great start. Cosmetics is what they are on the surface, but once you delve into the specifics, you’ll see they’ve carved a niche by providing ethical, organic and homemade cosmetics, that appeal to those who are conscious about the planet. If you’re looking to make a name for yourself in ecommerce, you need to decide what it is that you do best. Then, just like Lush, make the most of your assets to showcase to your target audience. It sounds super obvious, but you’d be surprised how many people don’t take the time to find their passion before diving headlong into business. If you’re half-hearted about something in life, in most cases there’s absolutely no drive to see it through. You’re not just selling a product, you’re selling an idea and a philosophy, and if you don’t have the drive required, then everything will feel flat and unappealing to potential customers. Emotions, either positive or negative often drive purchases, so understanding how important this is to your customer base is vital. Put everything you love to paper, even if you don’t think there’s anything behind it, and methodically assess the merits of each idea and how it could work as a business. Before you decide to pull the trigger on a particular idea, look at what’s around you. There may be a few companies already cleaning up in your sector, so you may decide that you’re not keen to take them on. However, if you do decide a niche is for you, you’ll need to know precisely what may hinder your potential rise to the top. Perhaps, you’re looking to move into fish food bait. This would be great if you’re passionate about helping fishermen catch more fish using natural foods and no additives. Start by popping “fish food” into SEMrush. After you click start now, the tool will generate data about your chosen search terms. Amongst this information, you’ll find the most valuable in “organic search results” – this is where your competitors live. From here you can see that “fish food” is quite a broad and competitive search term. But, you can always assess more specific terms like, “healthy fish bait”, “organic fish bait” etc. It can be tempting to fall into the trap of selling a whole gamut of cheap and cheerful items. Not necessarily, and it’s undoubtedly the wrong way to begin life as an ecommerce store. Target the more significant value items instead. Yes, you’ll need to focus more time on offering the education on why your product is so expensive. But if your sales projections are to make 10k a month, for example, would you rather sell ten thousand products at £1 each or 10 products at £1,000? Let’s take the fish food example again. If you’re offering bespoke fish food for anglers based on their specifications, using unique recipes and fantastic organic ingredients, then you’re in the right zone to make a lot of money, because you can simply charge more. If you’re already doing something similar for your own fishing requirements, then you’ve got all the resources and assets already in place. The same applies to any ecommerce niche or category offering bespoke services. It’s obvious to say that certain issues in the customer journey creates an environment where fewer purchases are made. Customers love an excellent perk such as giveaways, loyalty schemes and the like. However, you need to dig a little deeper and trace this idea back to its origin. For every idea that you put to paper earlier, they’ll be two, three or even five, different problems that people might run into. Perhaps a customer is heading off on a fishing trip that weekend and needs a faster turnaround on their custom order. So to address this, maybe you create a fast turnaround and delivery service that ensures that one particular order will take priority over the others. The easiest way to pinpoint your USP is to meet in the centre where the roads of passion, strength and the needs of the market meet. Passion – You need to be passionate about your product and the market you’re operating in. Strength – Your strength will help you to carve your own name, separate to that of your competition. Market Need – In the end, there must be a market for what you’re selling. Harking back to the fish food idea. With all the concern these days about the state of our rivers and oceans, conscious hobby fishermen are now more keen to fish sustainably and healthily. In this case, you’re passionate about providing an organic and healthy fishing bait that offers an excellent meal for the fish and protects the water balance from chemicals and additives that shouldn’t be there. Your strengths lie in understanding the fragile aquatic ecosystem, and the market is demanding products that are sustainable and ethical. Your ecommerce niche will shape your business. Which is why it is so important to understand and choose one. If you’re in the fish food bait niche, you’re in the angling game – or, the fishing bait niche to be more exact. Delving further into micro-niche territory – you are selling organic, additive-free fishing bait. When you’re selecting your niche, you shouldn’t follow the in-crowd. Forge the path less travelled for more significant results. Consider a niche that you’re already well equipped to compete in and then innovate your offering to showcase who you are and why you’re different.